A revolution in social care is coming. Helpr, a platform connecting social care workers with care recipients, is launching soon and it will change the British social care system. As Helpr’s partner, Netguru has helped develop the system, which includes a web platform and mobile apps for both Android and iOS devices. We’re proud to have contributed to such a worthwhile initiative and we will continue to support Helpr’s creators, Peter John and Steve Dailey. We encourage you to learn more about the project by reading our case study or the interview with Helpr's founders. The idea was to make the British social care system more efficient and user-friendly through a technological solution. And the cause is good. Helpr’s creators stress that their goal was not to build an agency - to the contrary, they wanted to remove the middlemen, which agencies are, to help clients save money and to help care workers earn more. Instead of earning the minimum wage, they can make up to 66% more with Helpr. Clients, meanwhile, get to pay up to 20% less. This focus on people is Helpr’s main characteristic. As an “introductory platform”, it connects the two ends of Britain’s highly regulated social care market. Making a profit is necessary for Helpr to survive, but not a priority. Peter and Steve want to put most of their efforts into improving role of carers and in doing so improve the the quality of the services Helpr delivers. Care workers are Helpr’s partners. Their needs are put first, right next to the needs of Helpr’s clients. Helpr’s main function might be to connect care workers directly with people who need their services, but the platform does so much more to help all its users. Savings for clients, better money for care workers and an overhaul of the social care system are only the tip of the iceberg. From the client’s perspective, Helpr is, in essence, an open market of assignments for certified care workers. The system displays assignments posted by local authorities or clients’ close ones. These assignments are tracked in real time and form concise, informative stories. Helpr stores information about when an assignment was posted, when a particular carer became responsible for it, when the carer began their work and when the work was finished. Information about cancelled and missed assignments can also be viewed in Helpr. The result is a very neat way for clients to order the services they need without worrying about the logistics, as Helpr handles all of that. The transparency helps clients and care recipients feel safe, while carers have a better idea what to expect from a given assignment. From the care workers’ perspective, Helpr is a partner that provides training, certification and an easy way to schedule work. Care Partners registered with Helpr receive free training and certification. They can also claim travel fees, the costs of procuring an uniform, and more. They work flexible hours, which allows more people to offer their services via the platform: mothers with children at school, students and recent retirees, all of whom appreciate the opportunity to work locally in their communities. Scheduling is important, as it helps workers fill their days with work they will get paid for, and ensures that as many clients as possible receive care. 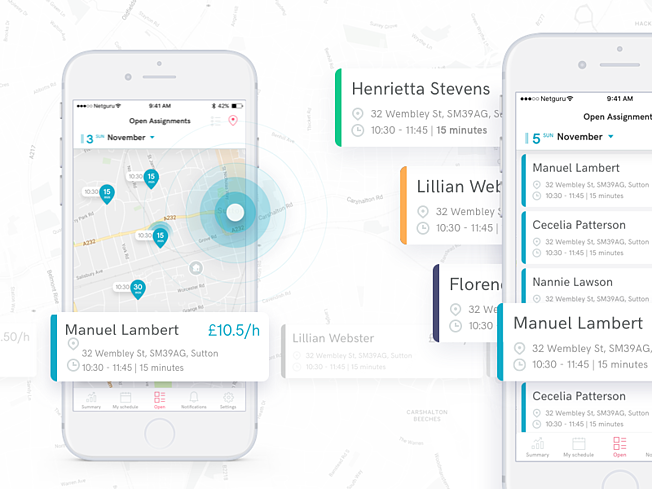 Workers can view assignments available in particular locations, which helps them with planning and minimising travel costs. A care partner’s day begins with Helpr as they start their morning commute to the first assignment of the day. Helpr tracks the distance traveled to allow the care worker to claim the costs. When the care worker walks into the client’s home, Helpr registers this information and continues to make the whole process transparent by keeping track of workers’ actions. The platform is truly transparent. Helpr includes a system of alerts for various occasions, e.g. when a care partner can’t get into the care recipient’s home. Additionally, users may add notes to the clients records, electronically, so that they are accessible to everyone and help convey crucial information. Finally, Helpr handles payments, which improves the financial security of care workers. Thanks to the system’s transparency, care workers know up front how much they will earn for completing particular assignments and they can schedule their days accordingly, based on their needs and preferences. From the care managers and supervisors’ perspective, Helpr is, first and foremost, a web app that displays data about assignments, clients and billing in the clearest way possible. 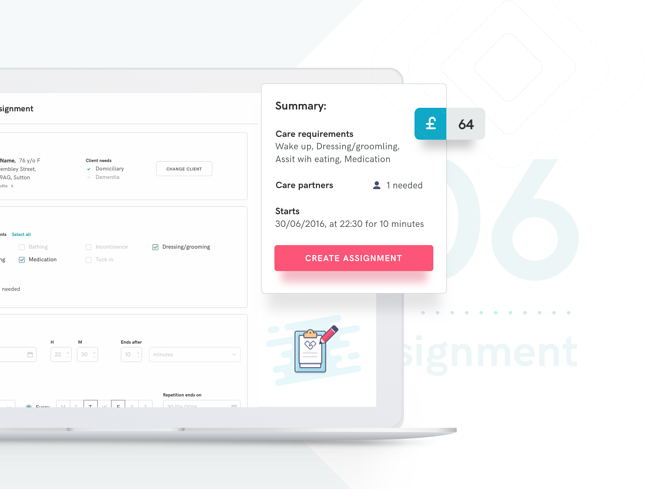 Creating new assignments is easy, intuitive and allows for specifying all of the client’s requirements and special conditions for the assignments. Helpr’s dashboard helps supervisors track managers, carers, assignments and alerts in real time, which allows for greater control, transparency and safety for all users. Importantly it ensures that all scheduled assignments are completed meaning that a visit to a vulnerable person cannot be ‘forgotten’. Helpr will be perceived differently by the different types of users. Clients will be able to post assignments and to easily access care workers’ services. Care workers will receive training, help with logistics and communication with other users, and financial security. Care managers and supervisors, on the other hand, will likely see Helpr as a tool that will give them greater control of the social care market in their area. All of this combined makes for a complex system that was a challenge to develop. It is, however, a worthwhile endeavour, as it has the capacity to help a great number of people. Helpr is an ambitious project not only because of its many systems. One of the main challenges faced by Peter and Steve was building a marketplace for such complex and highly regulated services. Since they had no background in the social care market, Peter and Steve had to learn a lot. As it turns out, each local council in Britain works differently. Meanwhile, agencies sell their services to private consumers according to their own processes. Making the platform usable for care partners in various locations and under various jurisdictions might have been the biggest challenge of the whole project. From the technological perspective, the system is fairly complex. It consists of a backend and a frontend for the web application, as well as native iOS and Android apps. Its full functionality is nothing to scoff at: online training, GPS tracking, payments, real-time alerts, and more. The first phase of development lasted 5 months. All the main components of the platform (the web, Android and iOS apps) as well as the monitoring system were built from scratch. Preparations for the next phase have already begun, so it is only a matter of time before Helpr offers its full functionality to users. It will certainly make the work of all people involved in the British social care system much easier, but it also has the potential to bring about a small revolution. Helpr shows social care in a different light: as a system that can be transparent, fair to both care workers and care recipients, and, most importantly, inherently human. We imagine that each assignment’s story will build understanding of the real needs and challenges of people who require or administer care. We cannot wait to see what kind of community grows around Helpr and we are proud to have contributed to this project. take a look at the presentation of the project on Behance. You can also contact us if you have any questions about the project.